THE big bang gave birth to this universe. 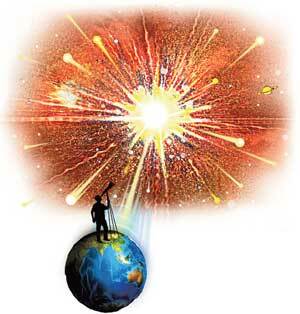 In the process, the cosmic explosion kicked off a rapid expansion of space. The universe is still expanding. The speed with which celestial bodies move to achieve this expansion is a mystery that has driven scientists up the wall. Scientists have for decades been trying to figure out the evolution of galaxiesthe most active research area in astrophysics. Several postulates have surfaced to explain what drives these inanimate objects to defy the laws of physics. One hypothesis that is a favourite among scientists is dark matter. It is an invisible force that cannot be detected easily but whose presence can be inferred from effects on visible matter. It is the force that makes stars run 299,792,458 metres per second (light year speed)a speed that is envied by space scientists and so far has only been replicated in science fiction movies. But that is just the tip of the iceberg.Dark matter, along with dark energy, is the dominating component that is supposed to constitute 95 per cent of the universe. Only 5 per cent of the mystery has been unravelled so far. In the 1930s Fritz Zwicky, an eminent astrophysicist from the California Institute of Technology in usa studied the speed of Coma Galaxy clusters, a collection of 1,000 identified galaxies. Zwicky was the first scientist to talk about the existence of dark matter; he was not taken seriously. As technology progressed astronomers continued with their space vigil and 40 years later they had to agree to the presence of dark matter as a logical explanation to the motion of stars. Further proof was provided by the Arcminute Cosmology Bolometer Array Receiver (acbar) and the Wilkinson Microwave Anisotropy Probe (wmap) that are trying to make sense of the cosmic afterglow left behind by Big Bang, called the cosmic microwave background radiation. Researchers from the school of physics and astronomy at Cardiff University at Wales in the UK and Kavli Institute for Particle Astrophysics and Cosmology at Stanford in usa used QUaD to study the afterglow. QUaD is an extragalactic surveyor located at the South Pole in Antarctica. This team has further strengthened the belief that dark matter does make up 95 per cent of everything in existence. Detailed maps of the cosmic microwave background were released in the November 1 issue of The Astrophysical Journal. The team has been able to investigate not just where the dark matter existed but also how it was moving and thus how the universe looked shortly after cosmic bodies came into existence following the Big Bang. The instruments used are highly sensitive and the observations though difficult to interpret very closely match the results hypothetically predicted by the existence of dark matter. Walter Gear of Stanford, one of the principal scientists, said: This reinforces the view that researchers are on the right track and need to learn more about the strange nature of dark energy and dark matter if we are to fully understand the workings of the universe. He, however, cautioned these are findings of the universe 400,000 years after it was formed and so understanding what happened in that crucial moment of the Big Bang needs patience and more research. Pijushpani Bhattacharjee, head of the Centre for Astro Particle Physics at the Saha Institute of Nuclear Physics in Kolkata, said It is a very important development. It has strengthened our view that dark matter dominates the dynamics of individual galaxies and clusters of galaxies, while the evolutionary dynamics of the universe as a whole in the present epoch is dominated by the dark energy. Bhattacharjees group is involved in studying the details of how dark matter is distributed in the Milky Way galaxy.